Great for making pies, jams and jellies, or just to eat for a healthy snack. No water or sugar added. This delicious summer fruit adds exotic sweetness to fruit salads and makes an excellent dessert or smoothie when mixed with yogurt. The health benefits of peaches include healthy eyesight, cancer prevention and lung health. Peaches are an excellent source of vitamin A in the form of beta-carotene and 1 peach contains about 10% of the daily value. Peaches are also rich in vitamin C (20% of the value per cup). They are also a good source of magnesium, potassium and copper. Carotenoids in peaches help promote good vision and are particularly good for boosting night vision. Beta-carotene has the potential to be converted to vitamin A, which helps with the production of rhodopsin, the night vision pigment in the retina of the eye. Beta-carotene can also help prevent cataracts and delay macular degeneration. Each 5 Lb. bag of peaches is packed in it's own styrofoam cooler with a large gel ice pack and then placed into a cardboard box for shipping. 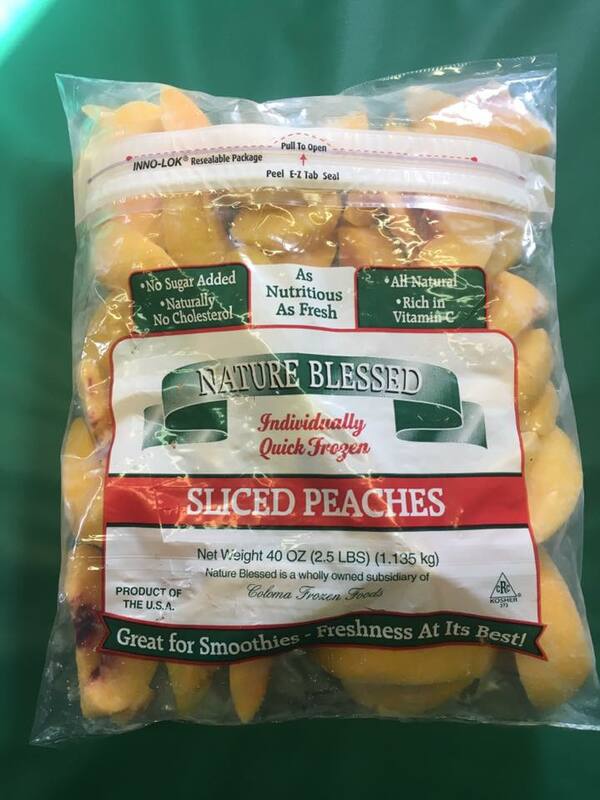 When ordering keep in mind that if you want the peaches to arrive frozen you need to choose on overnight or 1 day shipping option, If you choose another shipping option the peaches will thaw some, but can be re-froze when you receive them. We ship every Monday and Wednesday of each week year round excluding holidays. Keep in mind when ordering that there is always less thawing in the fall & winter months than in the summer months.